When we talk about a film, we often need to use some specific vocabulary related to the world of cinema. 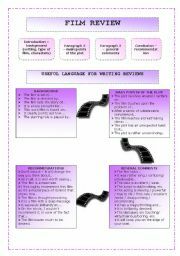 This worksheet provides students with useful vocabulary and phrases used in film reviews. 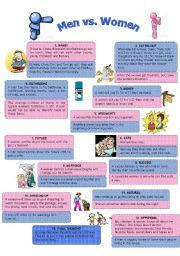 This is a very HUMOROUS and at the same time INTERESTING comparison of men and women (great activity for WOMEN´S DAY discussion)- as it is said that BEHIND EVERY JOKE THERE IS SOME TRUTH (it is taken from http://www.batchmates.com/bmtimes/content.aspx?contentId=335). Exercise on vocabulary is included. 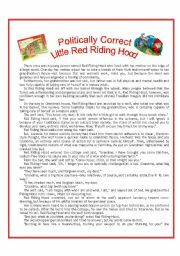 Here is a really FUNNY politically correct version of a famous fairy tale by J.F. Garner! You are sure to have a lot of LAUGHTER at the lesson!!!!! I prepared questions for discussion and exercise on politically correct language (keys included)! Here is a quiz that can be used when celebrating St. Valentine´s day. The analysis of the test is included. My students find it very interesting - do hope you and your students will enjoy it too!